When I started this Study Leave Blog back in February 2015, I had an idea what the end-point would look like, but wasn’t sure how I’d get there. 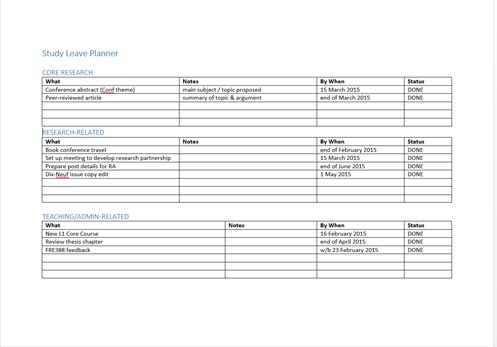 From day one, I focused on strategies for dealing effectively with a period of leave from teaching and admin responsibilities, and to help me with that, I devised a Study Leave Planner which I referred to regularly. By the end of Study Leave, I managed to complete everything I’d hoped for, plus a little bit more. This suggests that I was both realistic and optimistic about what I could get done. It wasn’t without its ups and downs, however, so I thought I’d share a few of the key points – both positive and negative – in a Study Leave Roundup. Why do you call it ‘Study Leave’? This was one of the first questions I got asked, by a colleague at another university. It’s a fair point. Study leave, or #studyleave if you use Twitter, has other resonances, namely school and college students going off to revise for GCSE and A-level exams. It makes academic study leave sound perhaps a bit simplistic. Other universities, including the one I used to work at, call it sabbatical. This term, too, has other connotations (if you’re on ‘sabbatical’ people think that means you’re taking time out doing nothing). Research leave is perhaps the most self-explanatory, but many outside of academia don’t understand what that means. So I decided to stick with study leave because it’s what my university officially calls it (and all the related paperwork surrounding the period of paid leave calls it that), and I really enjoyed using the #studyleave hashtag to find out what others were doing, whether of school age or academics like me. Officially, my study leave covered one semester – so the exact dates of the teaching term + the exam session attached to that semester. In reality, there are some issues with this. Other universities automatically include the long vacation that either precedes of follows, but mine doesn’t (recognising that summer is often ‘research time’ for most academics anyway, although there remains a moot point about exactly when you stop or pick up admin duties). In all, got about 4.5 months, or about 18-19 weeks, but there is some flexibility in the system. My first official week of leave was taken up still with marking and related exam admin from the previous semester, so I didn’t really get going properly until what should officially have been the second week of leave. This bleed-through of admin duties is an unavoidable feature of an academic’s career, but it needs to be handled sensitively and carefully, being respectful to other colleagues who take up the load when you’re on leave. Core Research: this was the section that expanded as I went along (to include new conference papers and remaining book chapters). Teaching/Admin-Related: all ticked off by end of March. I had set myself a mental writing target of 34,000 words by end of July. I completed 32,000 words by end of June, leaving me space to focus on revisions of the 2 articles I had submitted right at the start of study leave in February during June/July. What did you fail to do? Were there any issues that got in the way of researching? Working on 2 major building projects – one at my own home, one at my parents’ house 3 hours’ drive away. My mother fracturing her hip/pelvis in a cycling accident in February just as my father was about to head to Australia on a 2-week business trip. The way I dealt with these was to refer to my Study Leave Planner, and tweak the dates for each task, assigning ‘process’-type tasks to weeks when I was on the move and/or on a building site, and saving up the ‘thinking’ tasks to weeks when I had a clear diary. What helped you to keep up momentum? I never did any work in my office, although I did pop in from time to time to sort bits and pieces of admin and/or collect some paperwork or books I needed. Being back in the office is wonderful. Catching up with colleagues, and getting back into the swing of ‘normal’ academic life is not a downer like I thought it might be. I loved my time on leave, but I’m relishing the chance to get on with other things now leave has ended. Academics have lots of strategies for making progress with writing. Some are endless procrastinators, some have daily writing targets. Different approaches work for different people at different stages of a research piece, as the Twitter hashtag #writingpact attests to. The writing pact idea sees researchers of all levels from all around the globe publicly sharing their writing goals in the hope of attaining a greater sense of accountability and solidarity, especially for those enjoying a sustained period of writing (and the ‘isolation’ that comes with that). I work a little bit differently. I know I can write, and I know how much I can write. What I can’t predict is exactly how much I’ll do each day. Some days my brain is not in the right place for writing, so I do other tasks instead, or take a day off research/writing altogether. I don’t promise myself I will write x hundred words on a given day, because I’ll simply be annoyed with myself at the end of the day if I don’t achieve it. It means I’ve got short-term targets which flex, even if the longer-term targets remain the same. At the start of my study leave back in February, I set the target of writing the first 3 chapters of my new book, totalling 34,000 words, by the end of July. The end-date for those 34,000 words is not in fact the final week of my study leave (which is next week), because I accepted that (a) the end of my official period of institutional study leave tallies with the start of the summer vacation period which is when most academics get a lot of their research done, (b) I would need that amount of time to get that many words done. The upshot is that I am staring down the barrel of the approaching end of my study leave with 27,000 words already under my belt, with another week of study leave still to go, and at least another 5,000 words achievable within that time. It’s a huge achievement for me. And, more importantly, these are words which count, which have been edited pretty reasonably, and are not just words for the sake of words. In essence, I will have achieved my long-term writing target sooner than I planned. Which means I can crack on with the next chapter during the summer, keeping everything on schedule (or even a little bit ahead). I just hope that this isn’t the pride before the fall…! The traditional activity of the arts and humanities academic digging out and poring over rare manuscripts in archives and libraries still remains the bread-and-butter of our research, but it is changing. With increasing digitisation of so many resources, the need for travel and extended research trips to difficult-to-access archives (often negotiating with protective archivists and librarians) is waning. This doesn’t diminish the extent of the research we need to do, but it does make us rethink our modus operandi. For me, as I write and research my third book, I have noticed a significant change even in the 4 or 5 years since I was conducting the bulk of the primary research for my second book (in 2010-11, published 2012). One of the major resources I need to consult frequently is the Département de la Musique holdings at the Bibliothèque nationale de France in Paris. Contoversially scheduled to move sites in the coming years, the holdings and access to them are more precious than ever. Up until a few years ago, the majority of the catalogue (and holdings) were still only available in paper-card index format, consultable only in person at the rue Louvois site. Now, as I research less well-known French chanson and mélodie settings of Baudelaire, I am reliant once again on the Département de la Musique’s collections. Having assumed a research trip to Paris would be the first port of call for me as I deepened my primary research, I have discovered that in fact a number of the rare songs I need to consult are now available online, through the excellent Gallica digital library. It may not yet have everything, but it has meant that I could put off my travel until next month, enabling me to crack on sooner with the main bulk of the writing and research process of the first few chapters of my book. Brilliant as they are, however, digital resources aren’t everything. As many a researcher of historical documents will tell you, the digitised text doesn’t always show up everything you need to know. For one of the key composers I work on, for example, hand annotated versions of song offprints were done by the composer in coloured pencil, and sections of these annotations which have been erased and then rewritten are only visible on the original copy. Discovering the layers of rewriting by poets and composers often highlights some of the lost compositional processes, leading to a breakthrough in the research and analysis. And it is this old-fashioned style of traditional scholarship that still excites many of us, because it reveals hidden gems that the digitised world cannot yet show us. I find myself researching, then, in two modes: digitally, and non-digitally. Both modes have a key role to play in my work, as I adapt my way of researching according to what is available in each format. Restart by writing a pithy to-do list – not one with endless tasks on it but the key ones. Pick up anywhere – be it skim-reading an article on your reading list, working on a set of article revisions, tidying up a bibliography, or drafting paragraph you’ve been meaning to write – but time-limit your restarting work to an hour and then re-evaluate. Worrying about where to start can be the cause for serious procrastination otherwise! Manage your expectations – do not assume you’ll get back into full flow quickly, and remember it takes time for mind and body to readjust. Short bursts of defined modest-scale tasks will mean better chance of getting back up to full speed more quickly after the restart. It’s been about a week since I finished writing my latest book chapter. I know I need to tweak it still, but I also recognise that if I try to go in and do the changes straight away on my return from my short break I’ll make more errors than improvements. My time away from research was wonderful but not wholly relaxing (it involved 800 miles of driving, staying in two different places, and attending my best friend’s wedding where I was also singing a little solo and looking after another friend in a wheelchair). This meant that when I got back to my desk I was pretty exhausted and the productive research mindset I’d been in before I headed south was all but lost. Being mindful of the need to ease myself back in gently, I rejigged my Study Leave Planner, made quick reassessments of what useful work I could achieve, and set out to work on much smaller tasks than book writing. It has paid off. This morning my brain was beginning to fire in research mode again, and I’ve got another 1,000 words down on paper (this time starting a new chapter). With the weekend looming (together with a visit from the in laws) I’m trying not to feel frustrated that I won’t get a good writing run, but I’m recognising that it doesn’t matter, because I now have the right techniques to ensure that the restart isn’t too painfully slow next time. Interdisciplinary research has become a recent buzzword in academia, already perhaps descending into a tired cliché peddled by researchers who need to tick the boxes of university and funders’ requirements and expectations. Many of us have already been working interdisciplinarily for many years, as a result of our education and training which encourages exploring multiple options to find solutions to intractable problems. But what happens when two extremely disparate disciplines come into contact with one another? It can result in nothing beyond blind incomprehension as each is bamboozled by the other’s technical jargon and unfamiliar concepts. Or it can, on rare occasions, spark unexpectedly productive connections. This experience has reminded me that being open to the spark of unexpected connections made with completely unrelated areas of research is both important but incredibly daunting. In not seeking to become an expert in the other discipline, but instead questioning someone who is, there is a chance that the interdisciplinary process can open up whole new ways of thinking. One of the rare treats for an Arts & Humanities academic is to get to spend sustained time in a big research library. Not only do they offer unrivalled access to difficult-to-find books, scores, and other resources, but they also create a particular kind of working environment. The hushed tones, the deferential silence, the frenzied beavering, the glazed overwhelmingness; these are all discernible characteristics of those working in research libraries. In the past couple of weeks, I’ve been able to spend a good few days at the Western Bank Library (University of Sheffield), the University Library (UL) and the Pendlebury Music Library (both University of Cambridge). 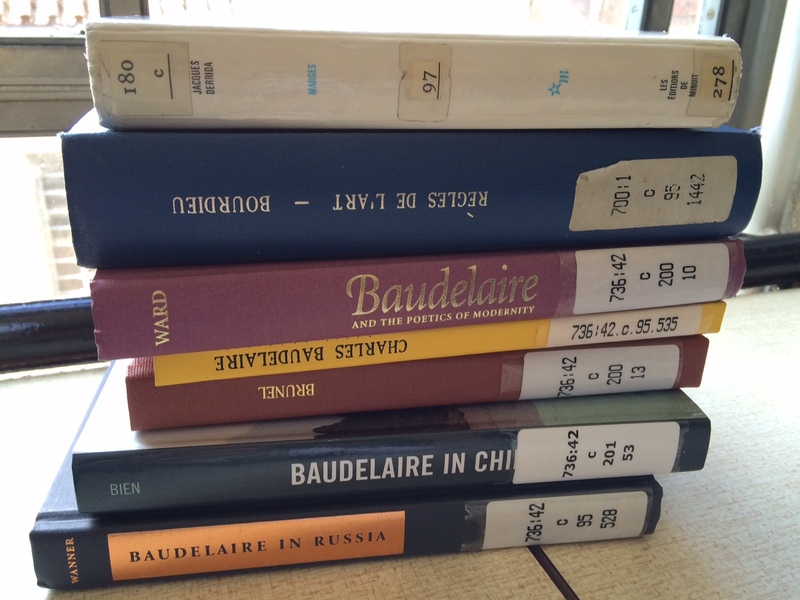 Each hosts a different set of resources useful to my book research, and to the broader Baudelaire Song Project as a whole. But the most beneficial thing for me about working in a proper research library, and especially the UL, is the happenstance moments that arise – where you come across a book on the shelves housed next to one you were looking for (and found) but didn’t know existed or that you would find useful. I came to the UL with a list of 6 books I needed to consult. I ended up ditching 2 of them as they turned out to be irrelevant to my project after all, but I picked up at least another 12, 2 of which were particularly transformational in reshaping a section of my argument in the chapter I am currently drafting. Academics are not always good at recognising milestones, and celebrating small achievements along the way can be hard. This is mostly because so much of our work is ongoing, other things can get in the way and become more pressing, and research needs to go through multiple iterations of editing and drafting before it can be released to the world. While this week may have been dominated by the major news of the UK General Election, I have been quietly working away on a book chapter (pretty much to the exclusion of everything else!) . Having set myself a 10,000-word writing target to achieve by the end of the week, I am pleased to report that I have hit my target, and can put the chapter to bed. It is only a small cog in the much bigger wheel that is the whole book, but it is an important staging post, and recognising the achievement (and rewarding myself with some lunch) is a key part of the book-writing process for me. My call to fellow academics (no matter what stage of career) is: share and celebrate your mini milestones (even if it will get buried in the ether of a busy news day). Writing an extended piece of research, such as a 90,000-word academic book, takes a particular type of writing. Academics have different systems for achieving their writing goals but are united in recognising how much headspace a big project takes in comparison to a stand-alone 8,000-word article. It’s a system that works for me, and which I’ve learnt over the years of writing (this is my third book). But I also recognise that I do sometimes need to adapt to new ways of working. In order to fund our research, academics dedicate hours of research time to drafting funding proposals in the hope of securing a grant from an external funder. In Arts & Humanities, the three main awarding bodies are the AHRC, the British Academy, and the Leverhulme Trust. In the 9 years of my academic career (post-PhD), I have applied for 7 or 8 grants of varying sizes, and been awarded 4, from each of the three funders. It’s a strong hit rate, which shows I’m doing something right, but I’m aware that success on a grant proposal is dependent on multiple factors. For me, one of the most important things is spending enough time writing the proposal and thinking through every detail of the project. I’m fortunate that, because of my first career in investment banking, I’m not afraid of putting together large budgeting spreadsheets to fully cost the grant, working with research office staff at my university to account for all the elements correctly. The costings segment of the proposal so often puts academics off (at least in my field) and it’s part of my mission to help break down those barriers to make the grant-writing process more manageable, sharing examples and best practice where possible. The most recent grant I’ve been awarded is by far the largest of my career, and it’s hugely exciting (full details to be announced when I launch the project later in the year!). I started drafting the proposal and assembling the right team in January 2014, but the project idea had been in germination since the end of my last grant (an AHRC Early Career Fellowship) in 2011. So when I finally submitted the proposal in October 2014, I was on about draft version no.20, but after nearly 3 years of planning, and 10 months of solid drafting and redrafting with my international collaborator, I was confident that I had considered all the elements carefully. For a project that will last 4 and a half years, it’s a big undertaking! 3 months after submission, reviewers’ comments came in, and I had a week to write and submit my PI response to the funding body (interrupting my study leave research plans for that week). It then took another 3 months before I heard the grant award outcome. Actually 6 months is a pretty speedy turnaround, so I’ve been particularly fortunate this time (on numerous levels!). For now, however, it’s business as normal. I’m still on study leave, I’m still writing my book, but I’m also starting to process the grant logistics to get everything in place to hit the ground running when the project officially starts in July (as my study leave comes to an end). I’ve noticed, though, that my mindset has already changed: I have a renewed confidence in the project and feel validated that a major funding body sees the importance of this research into French poetry and song. Being awarded the grant is a huge boost, mentally and financially. Yet I’m all too aware of the confidence-sapping you can get when a grant is turned down. This time round, my hard work has paid off; but I’m pragmatic enough to know that it won’t always be the case, and academics need the right support whatever the outcome. The format of a big subject association conference will be familiar to most academics: a small number of plenary lectures by leading academics interspersed with a larger number of parallel break-out panel sessions. When it all comes together well, it can be intellectually invigorating. When it is put together badly, it can be one of the most soul-destroying expreiences of our careers. By good fortune, the main subject assocation I am part of, the Society of Dix-Neuviémistes, run an extremely welcoming and productive annual conference. Coming away from the panel I spoke on this year*, I feel inspired and reassured that the future of our discipline is in very safe hands. While I am nearly 9 years post-PhD, my fellow panellists are all in the throes of starting out on their academic careers. What impressed me most was how each of them sought to challenge accepted viewpoints of the discipline, often interrogating the work of more senior colleagues sitting in the room listening to the papers. It is absolutely what conferences should be all about: finding the intellectual space to have those conversations which critique what we believe to be true of the areas we research. What will I do differently after this conference? If there is one thing, it is that I will be mindful to see my own research as part of a trajectory that is not just about what I can offer, but also about discipline-shaping. I don’t mean simply targetting that elusive concept of field-defining research. I mean thinking in terms of field-redefining by making sure the right questions can be asked along the way.